There is a gap in financial knowledge between men and women, especially among older and more educated Canadians. Also, a higher level of financial knowledge is more often associated with a higher degree of retirement preparation among labour market participants. These findings are included in two new studies released today, which are based on data from the Canadian Financial Capability Survey. In the survey, a 14-question quiz was administered to respondents to assess their financial literacy. The first study examined gender differences in financial literacy, while the second examined the link between retirement planning and financial literacy. The first article, "Gender differences in the financial knowledge of Canadians," found that men had higher financial literacy scores than women. In 2014, 22% of men correctly answered 5 of the 14 questions that were specifically related to the key issues of interest, inflation and risk diversification. This compared with 15% among women. In addition, women (31%) were less likely than men (43%) to consider themselves financially knowledgeable. The gender difference in financial knowledge was more pronounced among older Canadians, the university-educated and higher-income workers. For example, among Canadians who had a high school diploma or less, 11% of women and 16% of men correctly answered the five basic questions on inflation, interest and risk diversification. 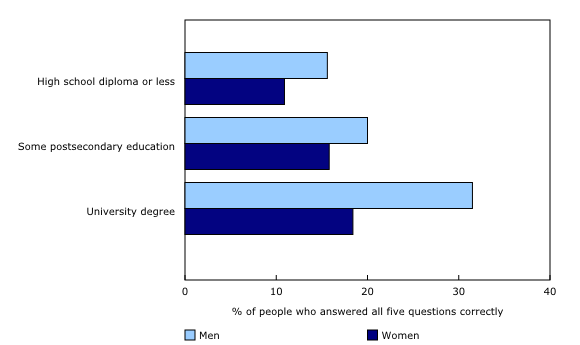 Among those who had a university education, the percentages were 18% for women and 32% for men. However, there was no gender difference in the financial knowledge of younger university graduates (under 35 years of age). Although men and women who were in a couple (married or common-law) had higher levels of financial knowledge than those who were not, a gender gap remained. Such a result raises the possibility that gender differences in financial knowledge between men and women in a couple could be due to gender specialization within the household. For instance, among men who reported that they were mainly responsible for household finances, 33% answered the five questions correctly. Among women who reported that their spouse was mainly responsible, 10% answered the five questions correctly. A similar result is found among men who contributed relatively more to the couple's total household income than women. Among partners who shared financial responsibilities or who contributed equally to total household income, there was no difference in the proportion of men and women who correctly answered the five financial questions. The second article, "Financial literacy and retirement planning," examined the link between financial literacy and the retirement preparation of labour market participants (employed and unemployed individuals). In 2014, 78% of labour market participants aged 25 to 64 reported that they were financially preparing for retirement, down slightly from 81% in 2009. Larger reductions in retirement preparation rates, however, were seen among younger labour market participants (down from 75% in 2009 to 66% in 2014) and those with a high school diploma or some postsecondary education (down from 80% to 71%). Among labour market participants who were financially preparing for retirement in 2014, just over one-third (34%) expected their primary source of retirement income to be workplace pensions, while 31% expected their main source of income to be registered retirement saving plans or retirement income funds. Another 13% expected their main source of income to be government pensions, 10% listed other sources and 12% did not know what their primary source of income in retirement would be. These numbers were nearly unchanged from 2009. The most financially literate labour market participants were not only more likely to be preparing for retirement, but also more likely to know how much they needed to save. Specifically, 57% of individuals with the highest financial literacy scores (at least 12 correct answers out of 14 questions) were preparing for retirement and knew how much to save. An additional 33% were preparing for retirement, but did not know how much to save, and about 10% were not preparing at all. Conversely, among those who had the lowest scores (seven correct answers or less), 28% were preparing for retirement and knew how much to save, while 43% were preparing without knowing how much to save. A little less than 30% were not preparing at all. The relationship between retirement preparation and financial literacy remained even after taking into account other factors associated with retirement preparation. The articles mentioned in this release are both based on data from the 2009 and 2014 cycles of the Canadian Financial Capability Survey (CFCS). The 2009 cycle was sponsored by the Financial Consumer Agency of Canada, Employment and Social Development Canada and the Department of Finance. The 2014 cycle was sponsored by the Financial Consumer Agency of Canada. In the first article, all survey respondents aged 18 and older are included. In the second article, the sample is restricted to labour market participants (employed and unemployed) who were aged 25 to 64, following the literature on retirement preparation. To obtain robust estimates, results related to the relationship between retirement preparation and financial literacy were based on a pooled sample of 2009 and 2014 observations. The CFCS collected both subjective and objective information on financial literacy. The objective portion on financial literacy in the survey consisted of a 14-question quiz on financial matters administered to survey respondents. About a quarter of labour market participants provided a correct answer to 7 questions or less; 26% answered 8 or 9 questions correctly ; 30% answered 10 or 11 questions correctly and 20% answered at least 12 questions correctly. The population could not be divided into exact quartiles given the distribution of scores. The first article, "Gender differences in the financial knowledge of Canadians," and the second article, "Financial literacy and retirement planning," are now available in Insights on Canadian Society (Catalogue number75-006-X), from the Browse by key resource module of our website, under Publications.